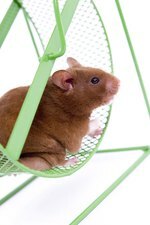 Parting with a pet is never easy, but sometimes pet owners wind up in a position where they need to locate a new home for their hamster. This situation is especially common in households where the owner accidentally bred her hamsters or unknowingly purchased a pregnant hamster. If you need to find a new home for one or more hamsters, you may have to try several different methods before you find the right place for your pet. Never underestimate the power of word of mouth. Let your friends, co-workers, veterinarian and family know you're trying to find a new home for your hamster. You may get lucky and discover that the perfect new home for your pet is with someone who already knows your pet and enjoys him. Talk to your local elementary school and ask if any of the teachers would like to have your hamster as a class pet. Social media sites and online classifieds may also be helpful for connecting you to the right home. Not all animal shelters and pet rescues are willing to take hamsters, but some are. Call around and find out if you have an animal shelter or pet rescue facility in your area that will either take your hamster or help you network with other animal lovers to find the right new home for him. A shelter that deals with small animals on a regular basis may be more helpful in finding your pet a new home than one that rarely handles these types of pets. You may also be able to contact an individual or pet-locator company that works hard to find the right pets for the right homes. If you purchased your hamster from a pet store or have one nearby, you may be able to get them to purchase the hamster back from you or help you resell your pet. Not all pet stores will buy hamsters from individuals, but it can't hurt to try.